This year’s BSA Annual Conference explores the changes and transformations that have taken place across the globe, from the financial crisis to political upheavals. This conference is an opportunity for sociologists to question how we best understand such developments and what opportunities sociology has to contribute to policy making and public discussion on such subjects. The religion stream will focus the contribution that the sociology of religion can make to this discussion, through addressing the connections and disconnections between sociology and the sociology of religion. An ever-increasing number of areas within the field of sociology are discussing religion, each with their own vocabularies, terms of reference and conceptual frameworks. As such, we would like to explore how best we can connect these discussions and what opportunities lay ahead for bridging such gaps. All paper abstracts and proposals for other events can be submitted online HERE. If you would like your abstract to be considered within the Sociology of Religion stream, please type SOCREL in capital letters at the top of your abstract. The deadline for submission of abstracts is 16 October 2015. Welcome to the annual conference of the European Association for the Study of Religions (EASR) that will be held from 28 June – 1 July 2016, at the University of Helsinki, Finland. The theme of the conference is Relocating religion. Religion has always been a moving concept. Throughout history, it has changed place, shape, function and content; conceptions of religion have been dependent on theoretical or political interests and strategies. Religion can be framed as a means of identity-work, world-building and well-being, but it can also be perceived as a consumer good or a security threat. Due to the open, fragile, and inherently negotiable nature of the category of ‘religion’, rigid definitions produce simplistic and distorted representations of the complexities involved in the formation of religious phenomena. At the same time, attempts to define and redefine religion in various contexts are themselves an important topic of research. All of this requires interdisciplinary scholarly imagination and critical new approaches. In recent scholarship, religious change has been conceptualized from a variety of theoretical perspectives. When focusing on the modern period, some scholars speak about the vitalization of religions, secularization and post-secularity, while others refer to re-sacralization and re-enchantment. Concurrently, the need for more knowledge and understanding not only of religion, but also of secularization, secular positions and non-religion has been underlined. Many of these perspectives highlight the significance of religious change as a cultural and social phenomenon. Such perspectives are, however, equally applicable to the study of religious transformations in other contexts than the modern period. The conference will offer the opportunity to explore changes and continuities in the forms, practices and implications of religion at all levels of societies and cultures, in the past as well as in the present. We invite proposals for closed sessions (with a fixed chair and speakers) and open sessions (with a chair and a theme). Organizers: The conference will be organized by the Study of Religions at the University of Helsinki in collaboration with the Finnish Society for the Study of Religion, Comparative Religion at the Åbo Akademi University and the Donner Institute, Turku. We are pleased to invite you to the 23rd Nordic conference for the Sociology of Religion. The conference will be held on the 17th–19th of August in 2016 at the University of Helsinki, Finland. The 23rd Nordic Conference for the Sociology of Religion seeks more understanding, both theoretically and empirically, on the changes in the religious field and their meaning for the individual, for religious and secular organisations, and for society at large. Contributions addressing these developments and changes at different levels and broadening the understanding of the role of religion in society today are warmly welcome. 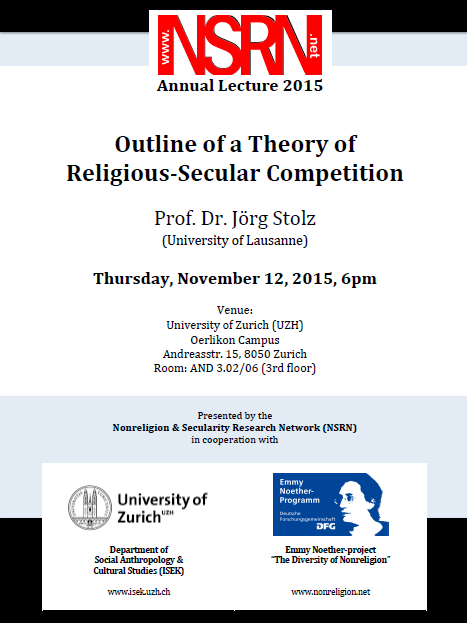 Other current topics within the sociology of religion will also be discussed. We encourage proposals for both sessions and individual papers. The dead line for session proposals is Nov 31, 2015. The dead line for paper proposals is March 15, 2016. Life here and hereafter is considered to be one of the core concerns of an individual throughout the history of humanity. Quest for the meaning of life, role of death, possibilities of life after death are challenged with a broad scope of perceptions, reflections and expressions among various spiritual and religious traditions, emerging spiritualities, groups and individuals. The 3rd Conference of the Lithuanian Society for the Study of Religions Life Here and Hereafter: Beliefs and Practices will be held on October 23-24, 2015 at Vilnius University, Vilnius. We welcome scholars from religious studies, sociology, anthropology, philosophy, psychology, political science, and other disciplines to contribute to historical and contemporary studies of the role and manifestations of the phenomenon of life here and hereafter, in this way enriching its academic understandings. We expect individual paper proposals as well as panel proposals with three to four presentations. Life here and hereafter in the popular culture. Submission of paper and session/panel proposals – June 15, 2015. Notification of acceptance and opening of the registration – July 15, 2015. The final date of the registration for the conference –September 15, 2015. Any conference related queries are to be sent to the conference email address.